“There is a sufficiency in the world for man’s need but not for man’s greed” said Mahatma Gandhi. At Omega, students started the Gaia club to create awareness about the concept of Gaia principle that proposes that living organisms interact with their inorganic surroundings on Earth to form a synergistic and self-regulating, complex system that helps to maintain and perpetuate the conditions for life on the planet. In Greek mythology, Gaia is the personification of the Earth and one of the Greek primordial deities. Gaia is the ancestral mother of all life: the primal Mother Earth goddess. Omegites are committed to sustain the health of the environment and constantly initiate activities to restore and promote the wellbeing of everyone, be it plants or animals. The Club’s initiatives align with the United Nations’ Sustainable Development Goals. Students study and are involved in various green projects within the campus and the community such as the tree plantation drive, the Adyar Link Canal Restoration Project, Waste Management and so on. Over 300 trees of 100 different native species have been planted by students around the campus in the last three years. Omega International School has been granted custodianship of the adjoining Adyar Link Canal by the TN Government to convert the derelict canal into a sustainable ecosystem. The efforts thus far have served to attract many species of wetland birds, fish and animals to the ecosystem. Over ten hives have been placed along the banks of the Adyar Link Canal as part of its Restoration Project. Students learn pot composting to produce organic manure from kitchen waste. Students explore ways in using the compost at our organic vegetable gardens. 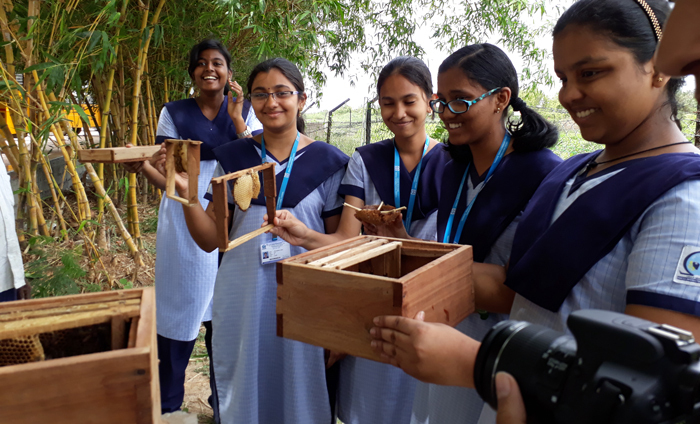 Junior students are regularly taken around the vast campus to explore the various green initiatives adopted at school and explore the measures that could be replicated at their homes.